Ise in Mie prefecture is more known for being home to Japan's most sacred Shinto shrine; Ise Jingu - than Golf courses, but with the backdrop of being Japan's ancient spiritual home and picture postcard geography, lies a Golf course and resort that will give you a modern and exciting experience unlike anything from its contemporaries in the more visited areas of Kansai. 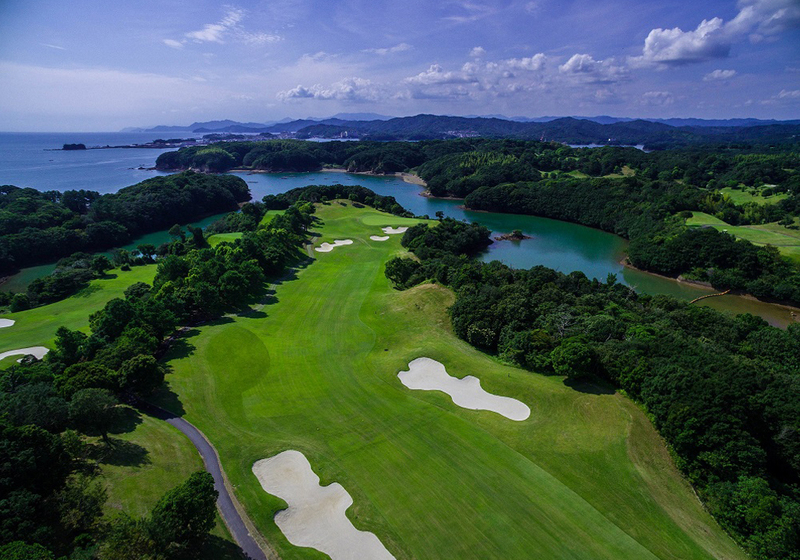 Located in the Ise Shima archipelago, the course was redesigned in 2015 by Pascuzzo/Pate Golf Design, the course was redesigned in order to make the course longer, and eligible for tour events, particularly for the JLPGA. The course from the tips is a 6,768-yard par 72. The recent redesign included adding an extensive driving range and short game practice area. All bunkers were re-cut as well as tee boxes lengthened. Certain holes like the 15th were also reworked to allow better views of Ago Bay. This course offers manual carts, and a caddy is not mandatory. It is possible to walk the course, but this needs to be requested in advance and may not be possible on weekends. Play through is possible during weekday rounds, not on weekends. 27 holes also possible during summer. The course is located just a stone's throw from the hotel and carts are readily available for guests to ferry clubs to and from the car park/hotel. The out course is a parkland with no ocean views and the standard Japanese pine hemmed fairways- but stunningly laid out and impeccably maintained. The 1st is a longish par 5 with water on the right, it then sweeps right with an elevated green, well protected by two large bunkers to the left and back of the green. This hole is one of the more difficult and scoring here is tricky. To make up for this, the following #2, par 4, is a shorter and relatively straight hole, a decent drive on this hole leaves a short iron to a receptive green, and the worst in our group made par here. The greens at Nemu are a little slower than what we were used to in Japan, with the stimp running at just 8.5 when we played, but we got used to it as the round went on. The 3rd and 4th were enjoyable with little to worry about, and then came the par-five 5th which is handicapped number 1, and a bit of a brute. And I can see why, as this long hole has a strategic bunker to worry about down the right off the tee, and a tapered fairway hemmed with two lush bushy trees on either side, which caused our group quite a lot of problems, some punched and shaped-shots required. After negotiating that, the green was smaller than the others with a tucked pin, surrounded by 3 bunkers. Scores from that hole will be omitted to save the blushes of this golfer and plying partners! The 6th is also a memorable par 3, with water on the right and left and with a massive bunker hugging the greens left side, a large gathering area on the right made that the safe shot, but inevitably the pin was on the left, we all took our chances with the pin but came out none the worse for it. The 7th, 8th and 9th were fairly straight forward and we tore through these. The 9th is an unusual finishing hole, in that it's wedged between the range and #6, and you need to go around numbers 1 and 2 to get to 10, this is via the clubhouse though - and in Japan, the traditional stop over for lunch. The 10th, 11th and 12th are a continuation of the parkland, but with the sweet smell of the sea on the air, we knew the seaside holes were to come. And it did, as you come off the green on 14th you immediately notice the wind is up and as you step on the tee for 14 you get your first glimpse of the ocean with a small inlet on the right, 15th moves away from the water with the 16th and definitely the feature hole, stretching out on a jutting headland as a gorgeous par 5 with quite a headwind. Views of the archipelago and the surrounding landscape are stunning- and to be savored. 17th turns back towards the clubhouse, scoring here feels a little easier with the helping wind. 18th is a beautiful finishing hole with picturesque green and white sanded bunkers overlooked by the elegant clubhouse. Practice facilities consist of an 18 bay range and a 300-yard beautifully maintained fairway with multiple greens, this was formerly number 10, but after reconstruction, it is now one of the best driving ranges in Japan. Some of the bays are covered for rainy days. The former 10th green is a wonderful chip-on practice area, including two large practice bunkers located just to the rear of the driving range bays. The Nemu Clubhouse was also renewed in 2015, with modern design and furnishings the clubhouse feels like a Tokyo 4 star hotel. A stylish panoramic restaurant "Green Side" overlooking the starting hole, has a variety of western and Japanese lunch options, the Ramen and seafood plate are both recommended. The Hotel, originally built in the 70's has had a major refurbishment, and like the clubhouse - is done to a very high level, the rooms are a mixture of western beds with tatami living areas. The hotel does not speak English - so not so set up for foreign guests, but it is possible to get by as signage and menus in English can be found. The Onsen bathhouse is large and highly recommended. Containing three pools; an outdoor onsen and two larger indoors (one with slightly cooler water than the other). These were excellent, and melt any tension from golf and the world away, and set up dinner and a beer very nicely. The Hotel has 3 restaurant options, including private dining spaces. Recommended is the sushi counter where you can see the chef prepare some of the finest local produce, expertly shaped and presented. Being close to one of the best fisheries in Japan, there is no wonder the seafood here is sensational. The Kaiseki set (selection of seasonal small seafood dishes) is very traditional and comes recomended as the most popular course. Non-seafood lovers will be happy to know they also have other western style dishes such as steak and pasta on the menu, albeit with their own local twist. There is both Japanese and western breakfast buffet in the morning. One of the highlights is the outside cafe available in the summer, on top of a hill overlooking the bay and course. Guests can enjoy a large tented area which offers glamping style food and drinks as well as toasting marshmallow area in a supervised campfire- a big hit with the kids. If it's a clear night you will not see a better place to see the stars. This course and resort are certainly out-of-the-way but recommended if you plan to go to Ise Jingu sightseeing and are looking for a close-to-nature experience. You will need a car though if you plan to travel around the local area, the club does offer a shuttle bus from Ise. *It takes 15 minutes to the resort by taxi or resort bus. EARLYBIRD GOLF IN JAPAN	Crazy but Genius!